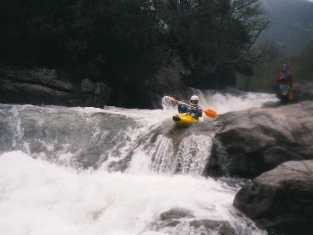 Close to Ajaccio, the Gravona is a good river for warm up/work up on first arrival. A gradual transition from grade 2 to grade 5 with no nasty surprises. A gauge at the bridge on the D1 gives an indication of level. 55 centimetres is a good medium level, but it could be paddled at least 30 centimetres higher or lower. The Prunelli is similarly a good warm up river, although a grade or two harder, and with one or two bigger falls in the lower section. The normal access is Ucciani bridge on the N193, or from a minor road bridge about 1 kilometre above this point alongside a small cafe. Initially running as a small reasonably shallow grade 2-3, the river slowly steepens and increases in difficulty. 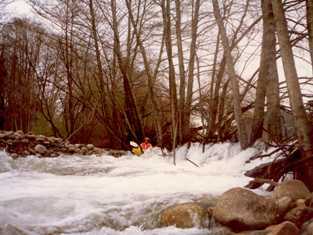 The main challenge early on is from strainers and trees but this gives good practice for much Corsican paddling. 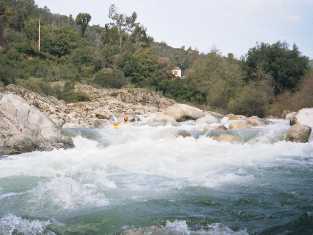 By a campsite close to Tavaco the river has become 4-5, although giving few falls that cannot be attempted on sight. The crux of the river is the stretch close to the D229 road bridge, and this should be recced beforehand. After a series of steepish falls, one nasty S bend is marked by a stream joining from the left immediately above it. This is often portaged on the left bank. One other fall 200 metres below the bridge is also reasonably turbulent but canoeable. After another 500 metres a 6 metre weir can be shot over a small depression in the lip 5 metres from the right bank. This whole section is about grade 5, but would vary quite a lot with the water level. After the weir the river eases down to grade 4. The exit point near Canale at the D1 road bridge gives an interesting choice of routes. The right bank gives a climb graded at about V Dif. The left bank is technically easier but much less pleasant, being an easy scramble up the Canale rubbish dump. Not an easy choice to make. Later in the upper Gravona. On the day after my ascent of the Canale tip (not being a climber) I was informed that the section downstream to the N 196 brige is pleasant, although reasonably flat, and gives a much more civilised exit. It may be worth considering, especially in high water. I have not paddled it myself, so I can give no further information apart the facts given here, told to me a friendly French paddler in a bar. In three years of Corsican paddling I can only think of one trip when I finished the day in a foul mood. The trip on the upper Prunelli started well, but soon degenerated due to the overgrown nature of the river. We were able to cut our way through some thickets, but this stopped when the saw blade snapped. It's a bad river that causes Fred Wondre to run out of gadgets. Pushing our way through the undergrowth I was then caught by a branch and capsized into a thorn thicket. When I checked my equipment after sorting myself out I realized that I had left the car keys back at the start point near the farm, and I would have to walk back to get them. The final indignity, and the most frightening part of my time in Corsica that year, was edging gently through the farmyard, past eight yelping guard dogs, trying to work out how long the dog's chains were, and were they longer than the distance between my legs and their teeth. It is only now, looking back after a few years, that I can bring myself to say that the Prunelli is quite a pleasant river, although nothing exceptional, as long as the right start point is chosen. Access is possible from the hydro-scheme close to Occana. Take the road down to the dam, then turn right down a farm track 50 yards above the dam gates. 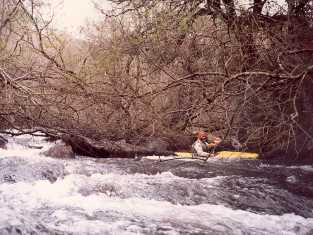 The river is initially steep, shallow, narrow and infested with overhanging branches. One grade 5 and one grade 6 fall are both also tree festooned. Thankfully a disused railway track on the right bank gives good portages. The Upper Prunelli above the D 103 road bridge - best avoided unless you like a challenge. After the D103 bridge close to Eccica (possibly a better start point) the river is mostly grade 3, with the occasional good grade 4 stretch to awaken interest. One pleasant gorge is enlivened by the addition of dumped cars providing interesting breakouts padded by tyres. The only difficulties are a 6 metre fall half way down, and the falls for 300 metres above the exit point. The two final drops have rocks in the middle of both, but both can be shot on the right. Exit at the bridge under the D203. 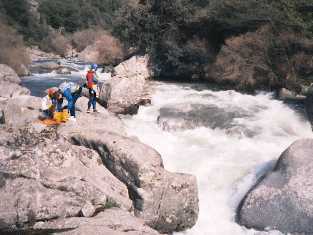 The Lower Prunelli - Corsican rivers close to civilisation are often regarded as convenient dumping grounds. These images from 1988 do not do justice to the Prunelli. 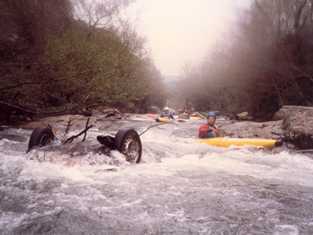 I have memories of paddling the river in later years in glorious sunshine and enjoying a good day out on fairly continuous easy grade 3-4, with a couple of bigger falls to raise the adrenaline. Sadly I have no photos.